The 2014 tennis season is rapidly approaching and we are beginning to new sponsorship deals are beginning to leak. 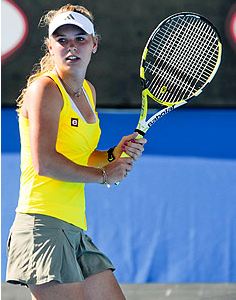 Caroline Wozniacki, the former No. 1 women's player and current No. 10, has returned to Babolat. The 23 year-old Danish player will be playing with a yet-to-be determined Babolat frame in 2014. Caroline previously had a Babolat contract which expired at the end of the 2010 season. Yonex subsequently signed the Dane to a lucrative equipment deal in 2011 while she was the No. 1 player. However, in July 2013, Yonex summarily dropped Caro from its roster. Caroline had secretly played a couple tournaments with a blacked-out frame (see picture below). This breached the terms of her Yonex deal and enraged Yonex's marketing staff. Pundits presumed that Caro had ditched her Yonex racquet to play with one of her old Babolat frames. Caroline and Yonex were said to have reached a settlement during the 2013 US Open. The settlement required Caro's US Open marketing to include images of her with her Yonex racquet. The terms of Caro's new Babolat deal are currently unknown.